The Maldives – a group of 1,192 coral islands in the middle of the Indian Ocean – might be associated with romantic honeymoons and its sugar-white beaches, but its real draw is found once you step off each island, as its Finding Nemo-style coral reefs are unlike most places in the world. Even the most crowded resorts are surrounded by crystal-clear waters teeming with parrot fish, angel fish, sea turtles, moray eels, reef sharks, manta rays and sting rays – all just seconds away from beachfront villas. So who’d want to stay on land? Because of their aquatic attractions, the Maldives leads the way in water activities. Even budget accommodation offers complimentary equipment, with the likes of canoes, snorkelling equipment and catamarans often as standard. But the better the resort, the more there is on offer. For example, the high-end Six Senses in Laamu has its own surf and dive/activities centres, offering the very latest trends in water sports. The newest addition, introduced in October 2015, is a night SUP (stand up paddleboarding). The paddleboard is complimentary in the day, but an add-on treat at sunset is to use Nocqua lights (LED lights especially designed for underwater activities) and experience the glassy waters in a completely different manner. There’s more for the gadget lover too, she explains. “We also have underwater scooters. It’s a propeller, like something you’d see in a Jams Bond movie. 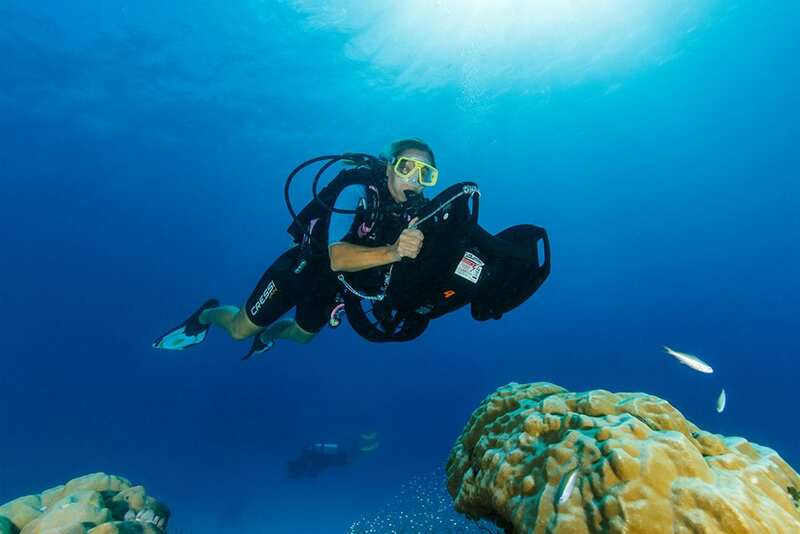 You have your dive equipment but instead of finning, you on hold onto it, push a button and it propels you forward so you just zoom along with your scooter,” she says. Surfing is a big draw to the Maldives, particularly as it benefits from full exposure to Southern Ocean swells, and between its scattered islands, host ideal surfing conditions all year around – you just have to chose where you go according to season. One of the most famous waves is the Yin Yang, located on the south-east side of Six Senses’ island. At its strongest between April and October, it transitions between a mellow outside and a tubular inside. “For beginners we have waves off the island that you can paddle out to, but the Yin Yang is an advanced wave and not everybody likes it. “The wave is a reef break: if you fall you don’t hit the sand like on a beach break, you hit the coral reefs instead. But it’s a five-minute boat ride away, and the boat and surf guide stay right nearby, so there’s always someone watching you. “There are also intermediate waves which are an hour boat ride away. They’re called Refugees and Machines – ‘Machines’ because the waves keep rolling and rolling and rolling. Of course, there’s extensive diving facilities with high quality equipment for all levels, but it was in Kurumba that my diving experience took place. The five-star resort is one of the best-known in the Maldives as it was the first to open back in 1972, and the nearest luxury hotel to the international airport in Male. There’s no resting on laurels, however. The hotel’s constantly been updated to make sure it’s one of the world’s best, including a watersports centre nestled within its luxury villas. The main instructor is Natalie, a former high-flying recruitment consultant for London’s banks, who jacked it all in 2008 and now lives a much more relaxed life diving in the Indian Ocean. To counter her daily deep dives with experienced clientele, she also teaches nervy people like me to take their first baby steps. While our test dive in the shallow shores of Kurumba’s white beaches proved her patience, the main dive in the deep blue waters proved the Maldives’ aquatic beauty. I remained slightly freaked-out (tip to novices: don’t overthink it) but even 10m down, holding on to Natalie for no good reason, I felt truly immersed in underwater life. Shoals of dartfish zig zagged past, black tip sharks swum alongside us (they’re nothing to fear, promise). Evil looking moray eels peeked out under corals, and parrot fish came in and out of view in all their luminescent glory. If ever one needs reminding about our insignificance on this earth, watching the activity beneath the surface is a strong reminder that ours is only bit part. If diving isn’t your thing, a snorkeling adventure is also powerful enough to cause an existential crisis. The house reef in Kurumba is phenomenal, like dipping in to an overactive aquarium. While I picked up my snorkeling gear, I was given instructions on where the best site was and how best to harness the currents. There’s buoys showing the way so easy it’s enough to follow but you’re unsure of snorkeling on your own, they offer guided tours of a section known as Sally’s Patch, with the snorkeling leaders pointing out sharks and rarer fish along the way. The house reef at the ultra-luxurious Coco Bodu Hithi is also one of the world’s best. At the end of a most decadent stay there, I took a house reef tour with their resident marine biologist Alyssa Gervais – which began on the ladder of my overwater villa. We gently followed the reef drop to watch the tropical fish in all their natural glory. Along the way she pointed out eels, puffer fish, nesting trigger fish to be avoided, plenty of baby sharks which love their shallow waters, and an enormous purple-tipped clam the size of a microwave oven. But best of all, we caught sight Yang Bao, one of their 22 resident hawksbill sea turtles who was first being spotted in July 2015 (they keep track). 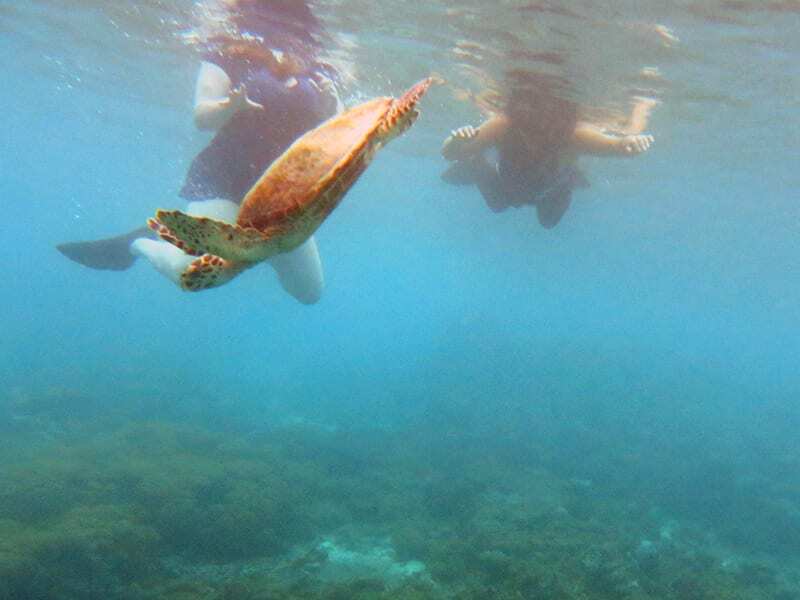 The massive turtle, unperturbed by our gawping eyes, barged past us to come up for air then gracefully wandered off into the deep blue. What an experience. While many waters around the globe have different strengths on offer – the surf, the facilities, the water temperature – the breadth of what the Maldives offer both on and below the surface make it one of must-see destinations for water sports fanatics. Just warn your partner beforehand. For information about Coco Bodu Hithi, North Malé Atoll, visit www.cocoboduhithi.com or email reservations@cocoboduhithi.com. 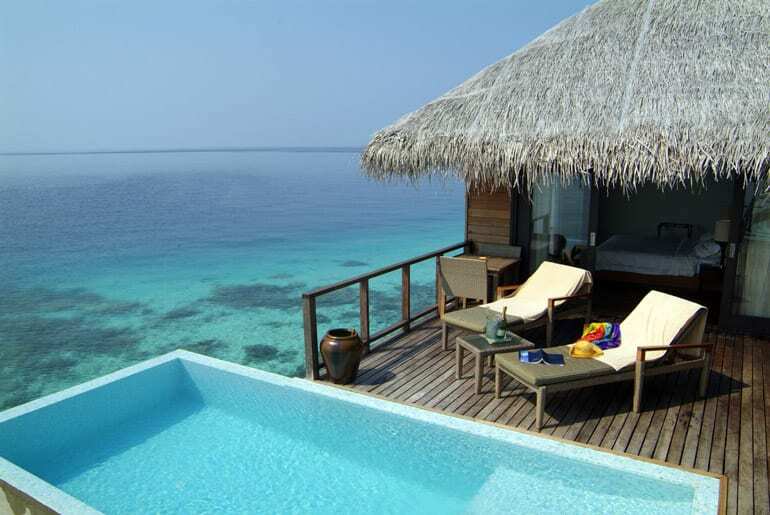 Lagoon Water Villas available at Six Senses Laamu from $808 USD per villa, per night, on a B&B basis. For more information, visit www.sixsenses.com.